Last week, we learned of a baby found dead in a Main Street flophouse, apparently strangled, with cotton stuffed in his nose and mouth. Police were looking for the woman who’d registered for the hotel room, a Mrs. W. Howard, who’d left the establishment the day before the infant’s body was discovered. Since then, things have gone from curious to curiouser. Police found a bundle of little Norman Howard’s sleepers stashed in a downtown department store shortly after the body was found. Captain of Detectives Bean said, "The mother is probably wandering around in a deranged condition and I believe she will either attempt to take her life or will put in an appearance at some institution within a few hours." While they continued to search for Howard, police investigations uncovered some information about the missing mother and her recent activities. Winnie Howard, 35, and her husband, Frank, had purchased a chicken farm in Norco, but separated soon afterwards; Winnie left the farm when she could no longer make the payments. Since then, she’d been staying with her baby in hotels around Riverside and Corona, finally going to her twin sister Minnie’s home in Reseda. Minnie Fabbro said that Winnie had left a few days before the baby was killed, and that she’d experienced a psychic vision where she saw her sister’s body floating in the ocean the night before police came to question her. After days of searching, Winnie Howard was finally found on the evening of August 26, not in the ocean, but at a Sierra Madre campground. She’d registered there under a false name, but had never claimed her campsite. Instead, Winnie had spent the four days since the death of her son wandering the hills without food or water. She was taken into custody, and placed under psychiatric watch. Upon hearing of Howard’s plight, a group of philanthropic club women took pity on her, and retained Attorney Milton Golden to defend her. Today, homicide investigator Eddie King files an insanity complaint against Howard, and the District Attorney’s Office warned that if Howard was found sane, they would charge her with murder. Golden replied that, despite this, they would fight the insanity charge. He said, "Mrs. Howard is not insane. She accidentally rolled over on the child in her sleep and caused its death. If the District Attorney’s office wants to file a murder complaint, we are ready to go to trial." As far as the Los Angeles Times shows, it never came to that. 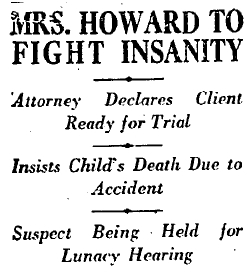 On September 6, Howard was declared sane and sent to a sanatorium for two weeks to complete her recovery. Afterwards, she was released into Minnie’s custody.